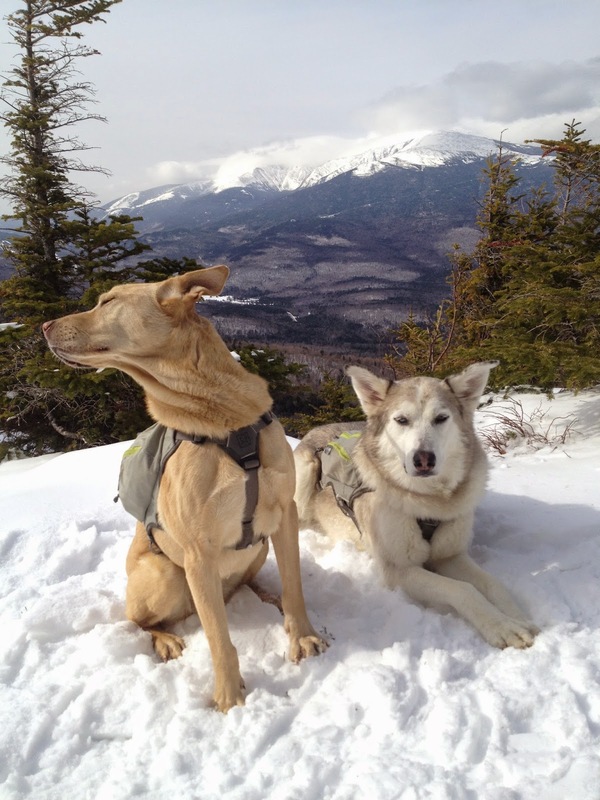 Reviews of local dog-friendly romps, tales from the trail, and ramblings about dog gear and fostering. 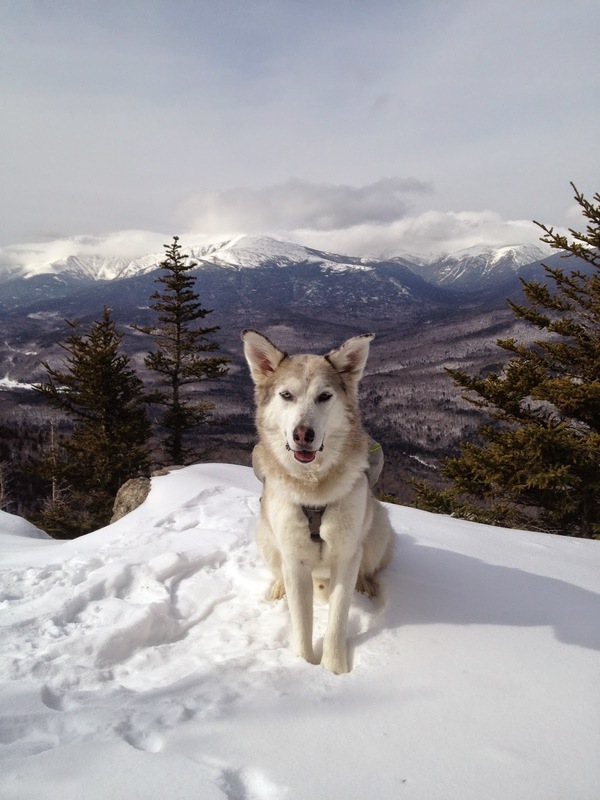 Join us as we discover the most awesome places for dogs around southern Maine and our favorite hikes in the White Mountains! 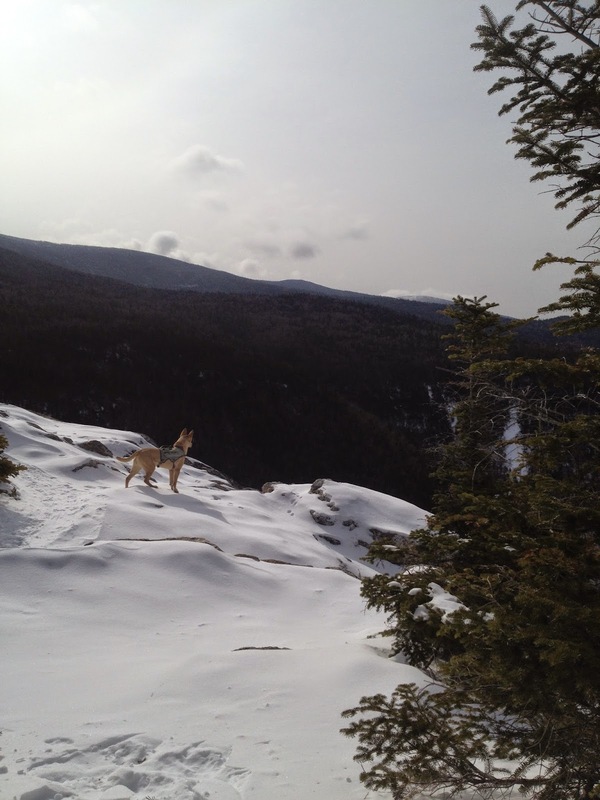 The original plan for today involved our foster pup Savannah on her first hike, another bipedal hiker, and the loop to Arethusa Falls (tallest waterfall in NH) and Frankenstein Cliffs to get some good mojo going for the new season. 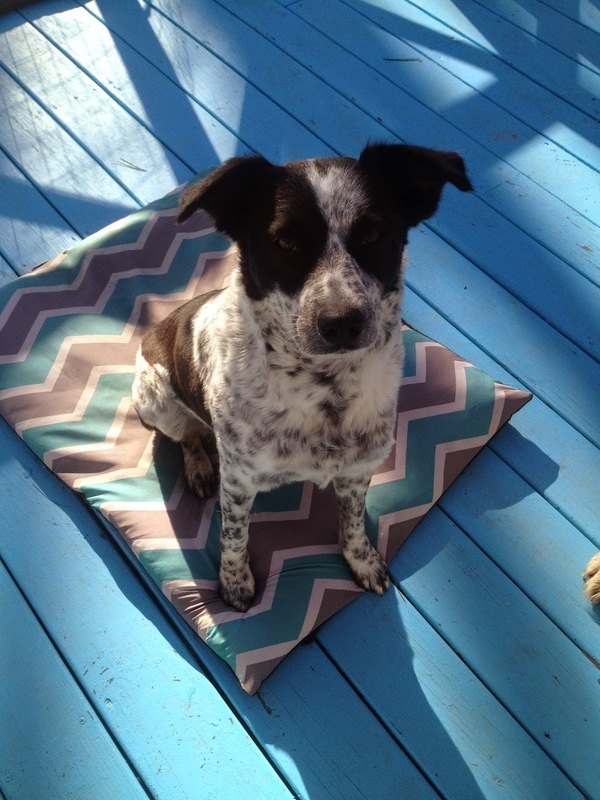 Instead, Savannah went and found herself an incredible home! Her family fell in love with her photo and wanted to meet her ASAP. ULPR processed their application and the next morning, they drove over ten hours to come for her. The rest of the plan dissolved after that and I settled on Hedgehog due to forecasted snow. I’m such a dork - I don’t sleep well the night before a hike and at 5:20 I was up and doing my final check of the weather. They pushed the snow’s ETA back to the evening so I scrapped my Hedgehog plans for Imp Face in the Carter Range, excited for the up close-up views of the Presidential range, in the clouds or not. Imp Face had darted across my radar before but I dismissed it once I read it described as steep with rough terrain. 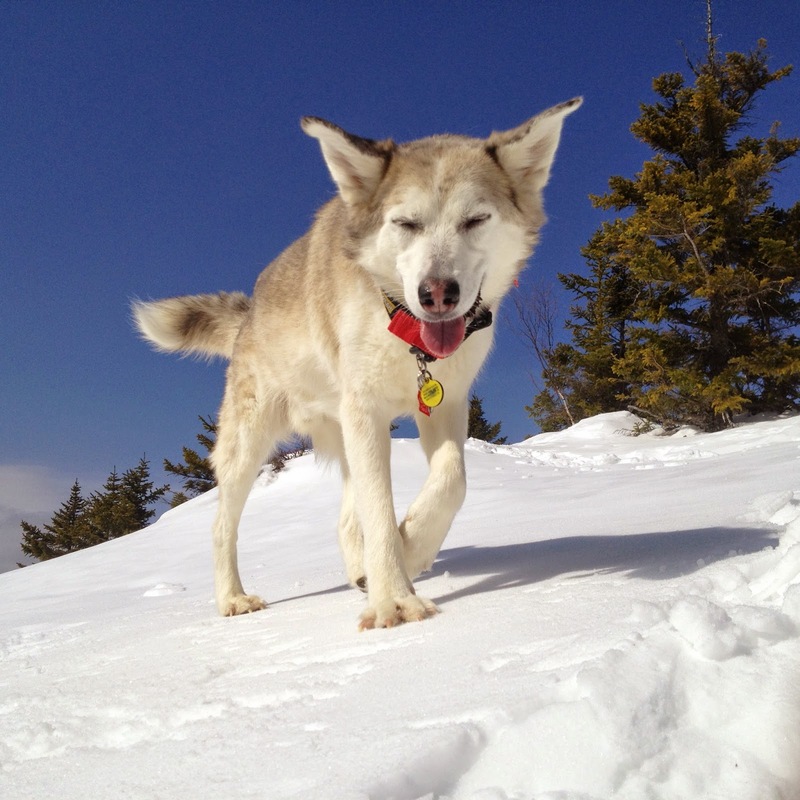 Matching the hike to Tango’s lower energy level and stamina is crucial to him having a good time. Today it is seemed like a great choice, covered in snow, still in the cooler weather (but mercifully warmer than it has been! ), and perfect “winter” mileage for us. The Imp Trail is an almost-loop. There is a very short (.2-.3 mile) road walk (plenty of shoulder space) between the northern and southern ends. I think the best direction is clockwise, starting at the northern trailhead. Imp Face is approximately 2.2 miles from that trailhead. Then it is a gentle .9 miles to the North Carter Trail junction, where (for the loop) you turn back down the southern portion of the Imp Trail. That way, if one chooses to shorten the hike, they get the payoff and then can simply turn around. For me, the morale aspect is just as important. I’d much rather hit the high point first. 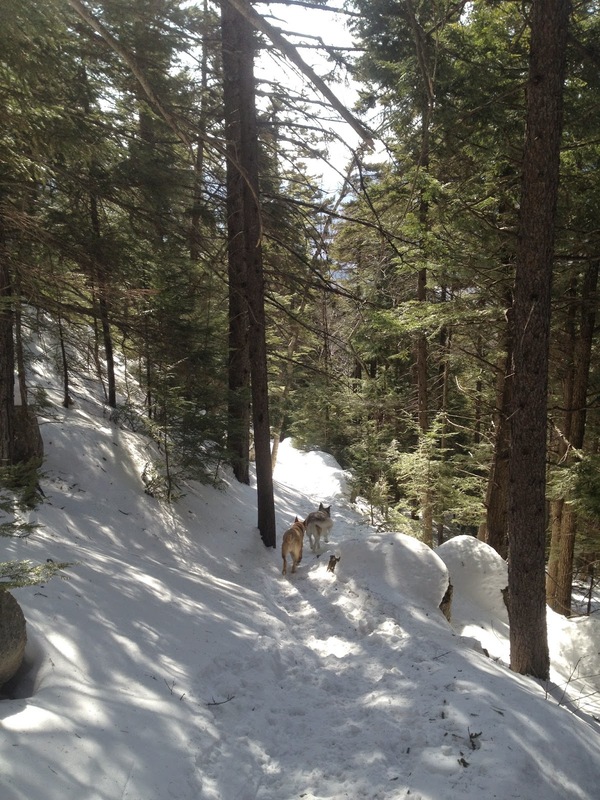 The dogs were ecstatic to hit the trail. It begins gently and we glimpsed running water for our first time this year. Perhaps inspired by the impish outcropping for which the prominence earned its name, the trail is a funky one. The grade varies frequently over its course. After beginning gently and becoming more moderate, it kicks into steep mode, then gentle, steep, moderate….. If I had better map-reading skills, I could provide more detail, but where the ascent truly begins, that all changes and it is mostly just steep with few reprieves. Hiking poles would have been very helpful, had I the sense to bring them but I do not generally use them and it slipped my mind. The dogs were generally far ahead of me and Tango required even fewer breaks than me, although he definitely tried to turn a few quick rub downs into full-on massage sessions! As I trudged upwards, knowing we were close, I looked up a straightaway to see gleaming sunlight and knew we were there. I told the dogs to be careful (yes, we have conversations) and they proceeded ahead and were looking out at the expansive view when I arrived onto the small platform that is the Face. Wow. I must’ve said that word 20 times. First off, the clouds weren’t as thick as anticipated (except around the cone, as usual!) and Mount Washington was stunning. I am always in awe of Presidentials, especially in the snow, when they are imposing in the most spectacular way. I took a zillion pictures, none of which do them justice. I tried to take our traditional “summit” photos but Ty felt like being a brat, looking miserable in all of them. She has worked hard on managing her impatience when we stop but today was not a day of improvement. Tango was much more cooperative so I snapped a few shots of him. I waved goodbye and we disappeared back into the woods. practice with a new command were impeccable so I can't complain! Up until that point, the trail was well broken out. Continuing on from the Face, it was choppy in points but still broken out and a very gently grade to the North Carter Trail junction, where we had what is normally our “summit snack.” The southern side of the trail is not in the greatest shape. Some sections are mildly or severely postholed. 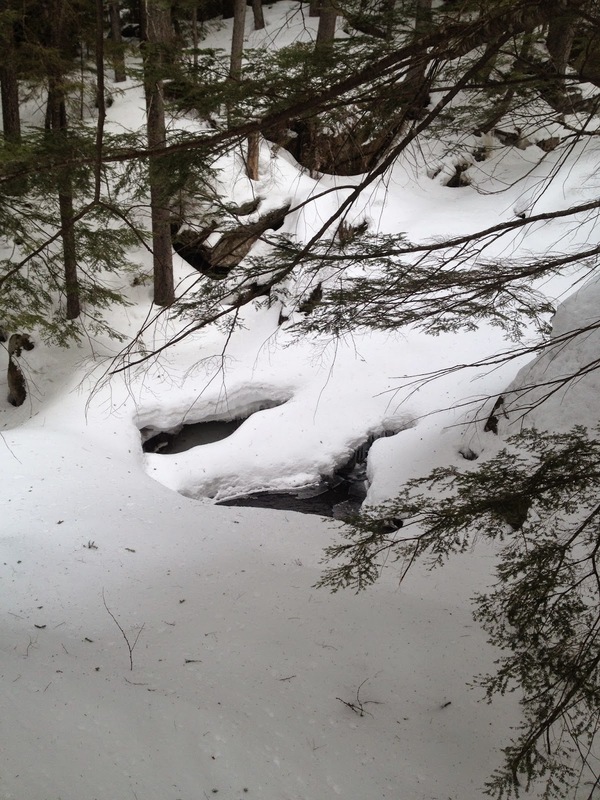 Quick tangent on snowshoes: Under the majority of circumstances where snow is beneath one’s feet, they are a must. In fresh powder, they are needed for floatation. 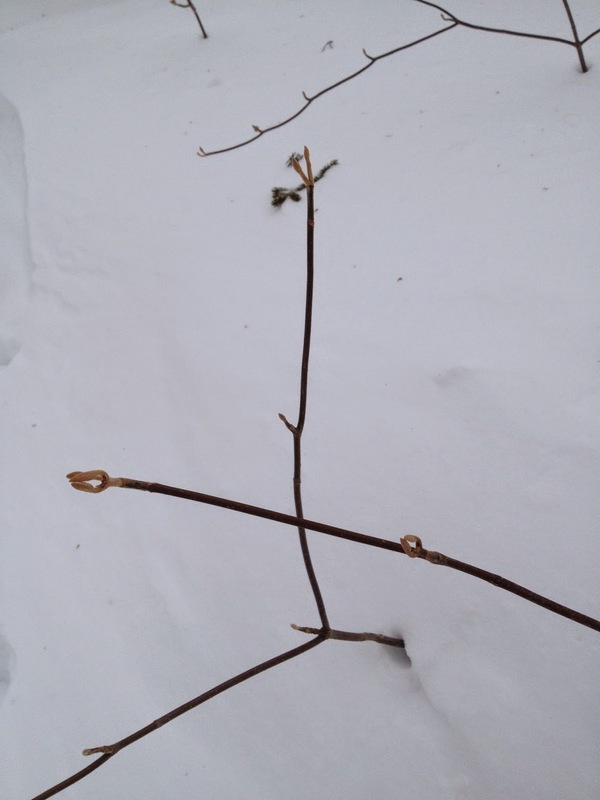 Once the weather warms, the snow melts and, again, one sinks. The deep footprints left behind (postholes), are nasty for other hikers to try to maneuver and even more challenging for dogs. 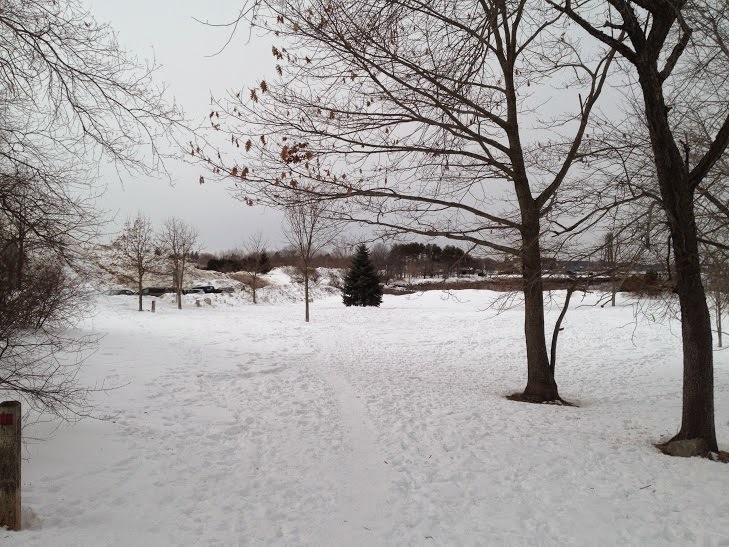 Please wear your snowshoes, or, if you’re unsure, ask for advice! 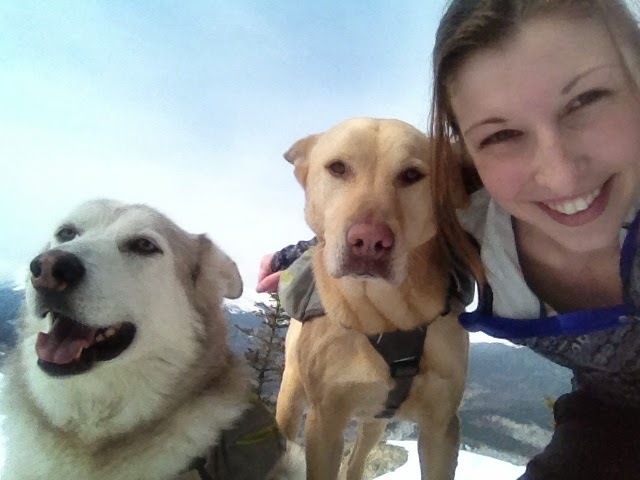 Remember your snowshoes or you'll get stink face from your fellow hikers! staring at the sky - hence their dirty looks! Thankfully, the dogs were in their usual “all business” mode, trotting downward and the sun was out so it was beautiful. By the time we reached the car, clouds had taken over and I was stoked that our timing seemed to have been perfect. The more cold weather hiking we do, the more I like it and the more bittersweet it feels to great spring. Dogs had fun, I had fun, I’m tickled pink the weather gods were kind to us again, and apparently, we get to check another off of the 52 With a View list, so all in all, another great day in the Whites! 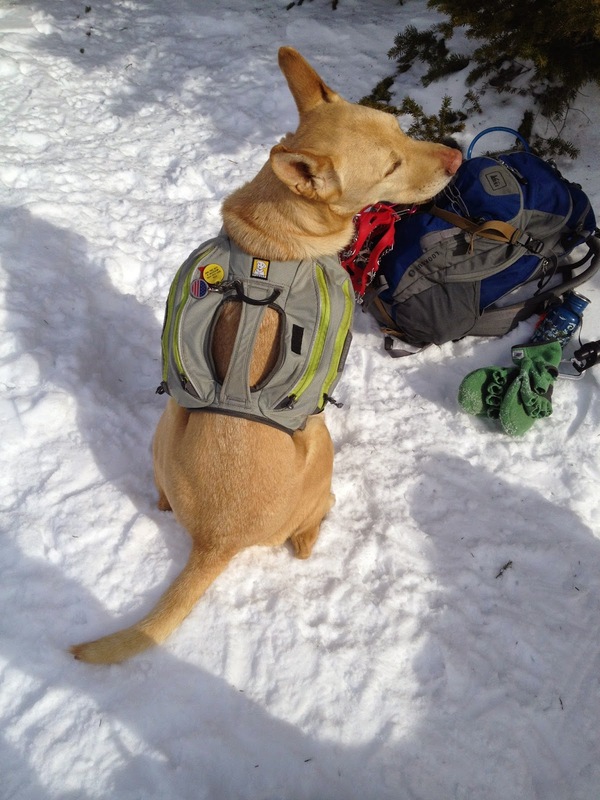 Last month, Backcountry K-9 sent us Ruffwear’s Omnijoring Hip Belt to review. 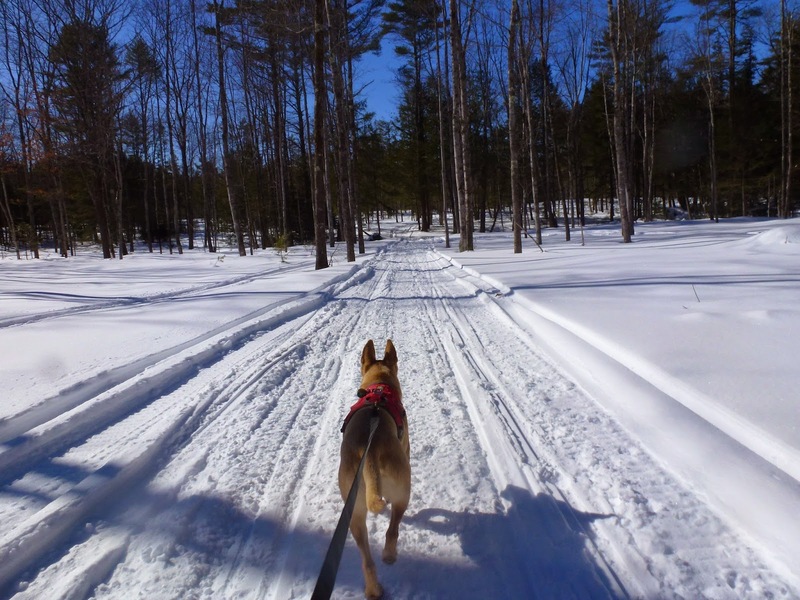 The parks and trails around here are different from what we were accustomed to in Portsmouth, NH – a lot more leashed, multi-use trails. Ty craves off leash time and outlets for her high prey drive so we looked into sports like barn hunts and agility but class availability and scheduling were a challenge. 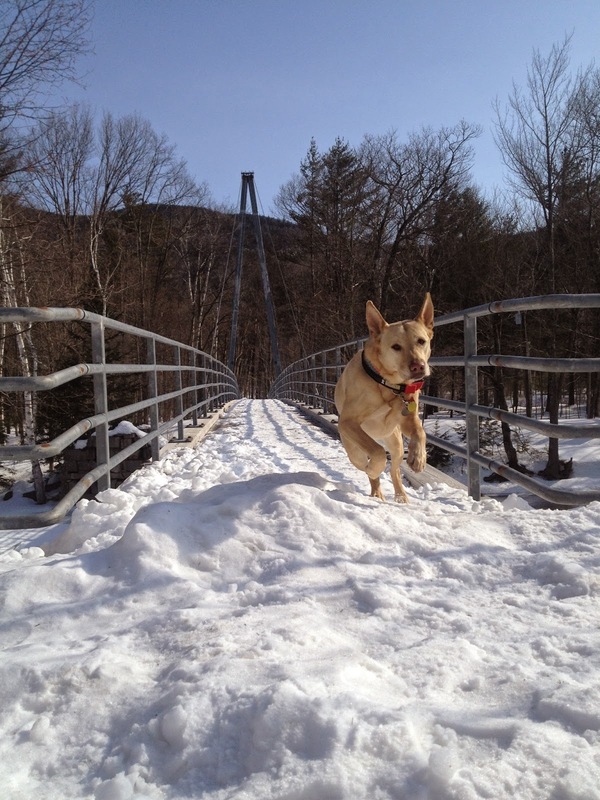 Enter the thought of canicross…. Our first trial was just me and Ty on the snowmobile trail behind the house. It didn’t take long before I realized there’s a bit more of a learning curve than I expected. After years of working with her to walk with a loose leash, I was asking her to pull me. I picked the word “pull” as the command and she picked it up pretty quickly. We came to the agreement that she likes to have the lead stretched just enough to engage the bungee. Ty’s a jogger by nature but in the stalking/hunting sense. Teaching her to focus down the path and not abruptly planting her face in the ground or veering to where the deer prints cross the trail will be of great benefit! It’s also very cool to continue working on some directional commands we have been informally working on for awhile. To tie this back into the belt trial, it provides excellent cushioning, should you have a dog who pulls with more gusto. 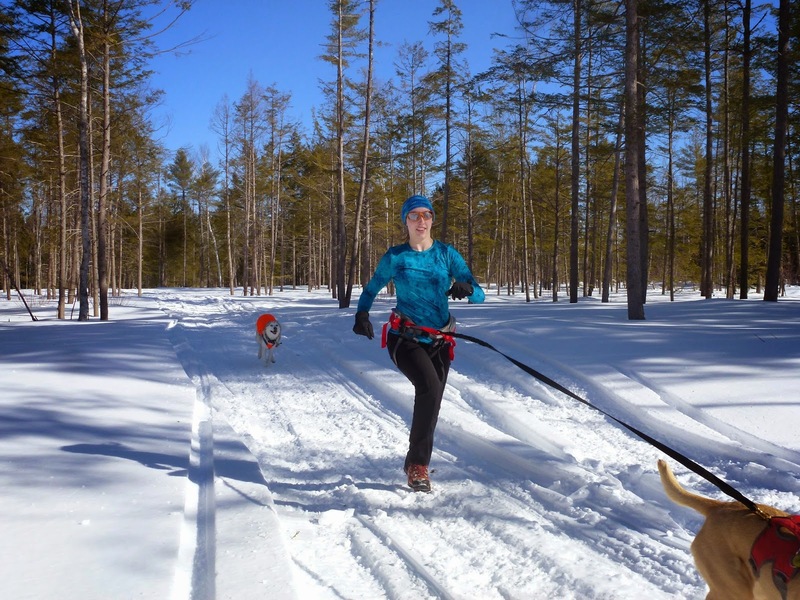 The toughest part of canicross is getting in that groove. First time (second, third) that everything falls into place – elation! It was a little tricky being our own photographer. I mostly just want to share Tango's awesome expressions! The belt is comfortable and, just like a backpack, needs adjusting and readjusting for it to settle to my form. The first few runs, I left the leg straps at home, thinking they would be overkill for our mini-jogs. My suggestion: wear them; they help the belt stay low on your waist. It is fantastic to have the pockets since the belt covers the coat’s pockets and they’re a little more convenient anyhow. I wasn’t sure about the tow line attachment’s strength but I was overthinking it; it works great and is a great safety feature. My overall message is this is a great piece of gear to have. 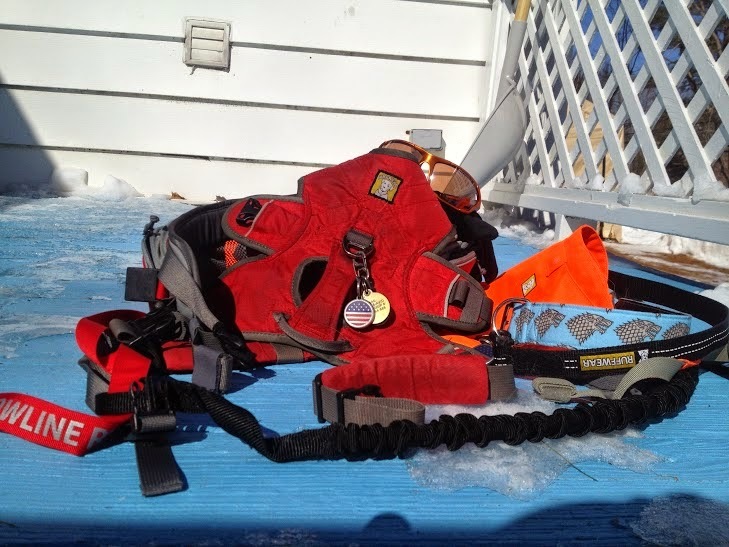 It feels awesome to be jogging in unison with the dog(s) and it makes me want to try out the other joring sports (when I come across the funds for the remaining gear!). It’s versatile, very comfortable, and I admit to wearing it even on more mellow outings because of the ease of walking the dogs and handy pockets. I think the ability to canicross on local wooded trails is going to go a long way in helping Ty maintain her sanity - getting heavy exercise while feeling a little more independent than another leash choice - and keeping her safely and legally attached to me. Thanks for the reads everyone, have a GREAT weekend! I slept in til 7:00 today, glimpsed at the bright, beautiful sun out the window and started my day rested but regretful we weren’t already on the road. That’s how my mind works – always overthinking. Thankfully, Ty and Tango aren’t like that. They were stoked to eat breakfast and jump in the car. I could learn a lot from them…. We reached the Davis Path trailhead on 302 in Hart’s Location (or thereabouts) eager to hit the trail. One never knows how the Notch is going to be and I was downright giddy that the sun was still shining and the air temp was comparable to my age. 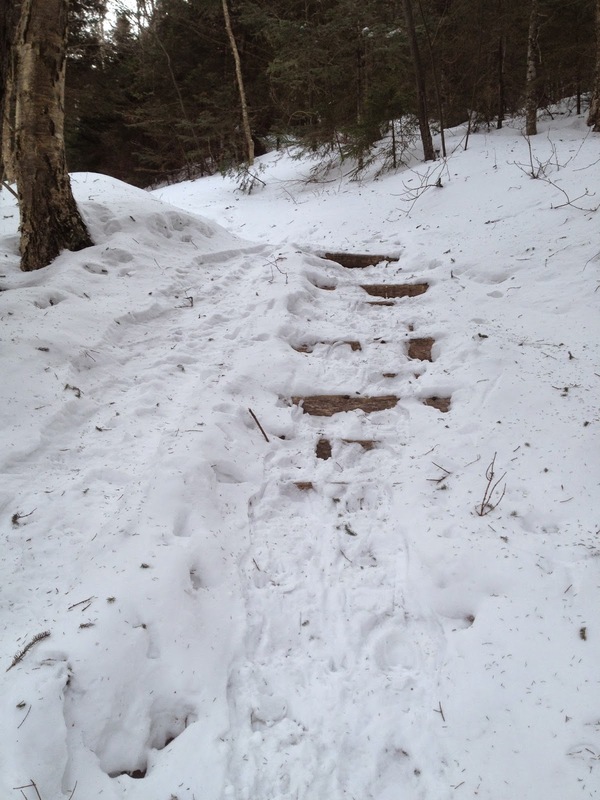 The trail was a highway and the snow wasn’t the mush-over-monorail it will soon become. There were a few very brief stretches with some postholing but micros worked sufficiently well. It was also obvious someone had a blast sledding. The trail is definitely steep enough for it and while it’s a shorter hike than Kearsarge, North, it does seem steeper to me. 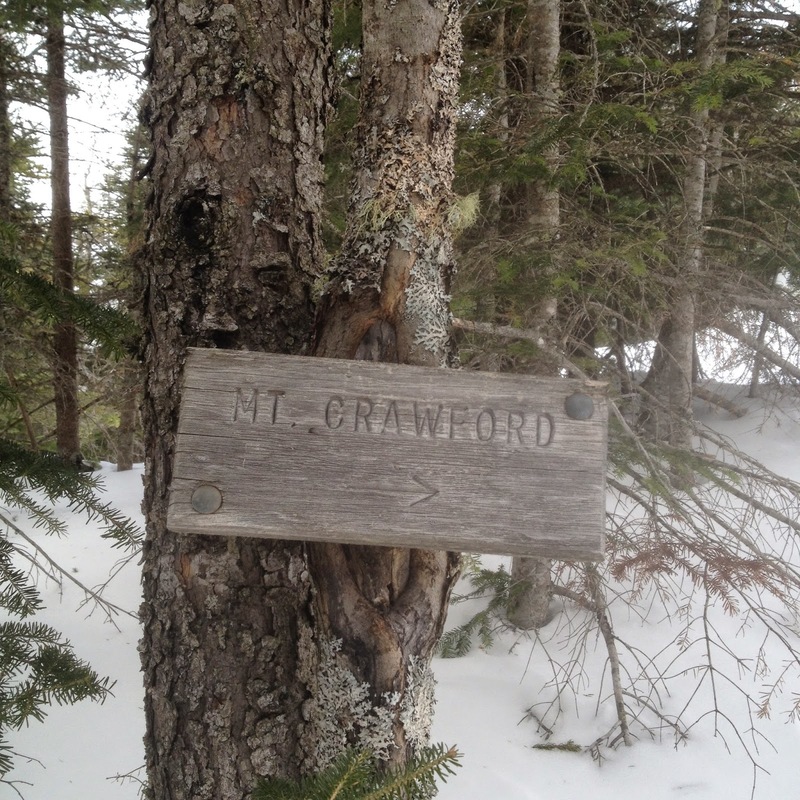 About two miles in is the spur to Crawford. 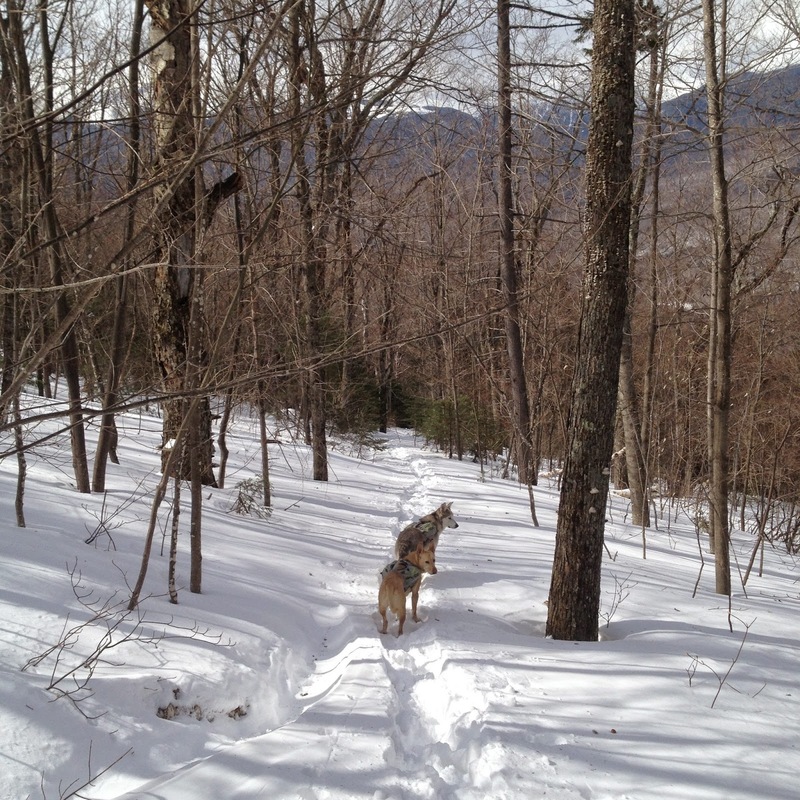 Shortly after turning on the spur, I threw on the snowshoes. It appears most folks are passing Crawford and heading on to Stairs. Then came the day’s surprise as I reached the top of a short, steep section to look up and realize it was the exact spot we had been in 3 years ago, confused and feeling defeated. I laughed out loud. About a year before we started taking hiking seriously, we tried out the Davis Path. I felt uncomfortable the whole way and, upon reaching this location, I couldn’t find the trail and turned around somewhere in its vicinity. Today, I recognized the spot instantly and busted out laughing. Today was such a different experience – so full of confidence and overwhelming joy. I sympathized with my past hesitations as I looked around for the trail. My eyes landed on the dogs ahead to the right and turned my shoes towards them, knowing they’ve proven to be great compasses. Four minutes later, we were at the summit. The first glimpse of the Presis knocked the wind out of me; I have been pining for another visit with them for months. The wind only started whipping at the very top and it was intermittent. 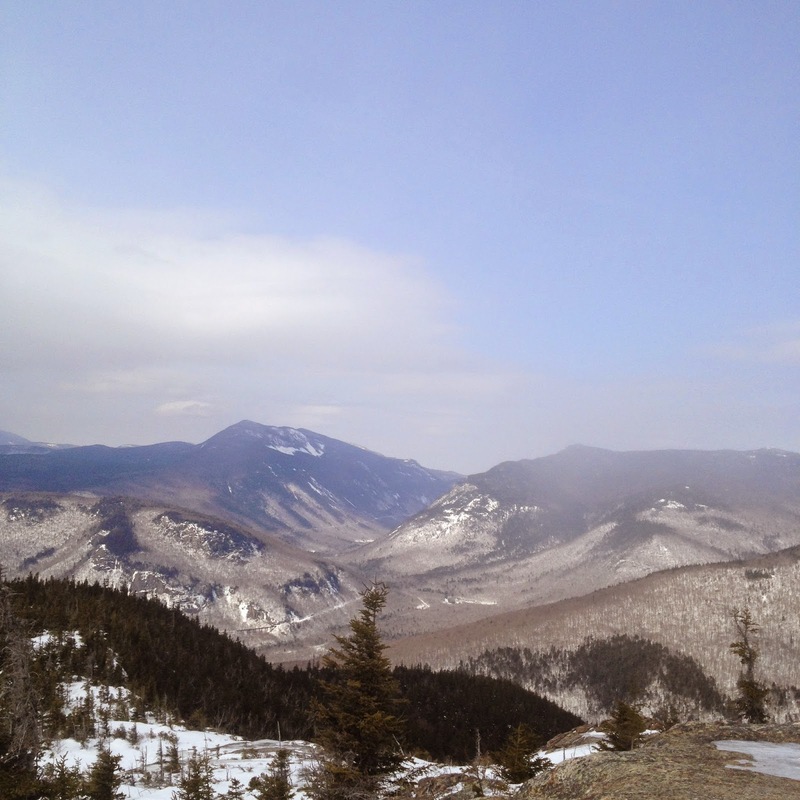 The views from the summit are 360 spectacular degrees of mountains, from the Presis all the way down Crawford Notch. I lingered as long as the dogs would allow and vowed to return soon! 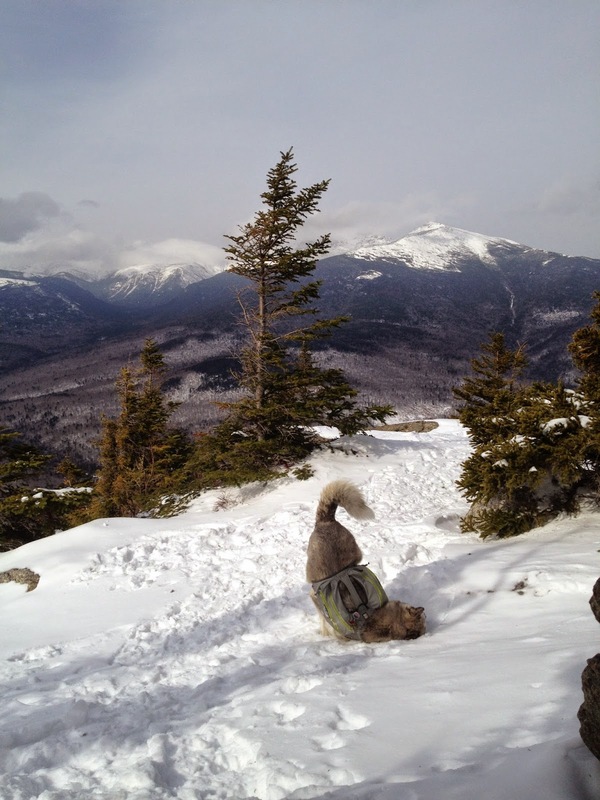 Now to corral this back into a blog about dogs hiking! 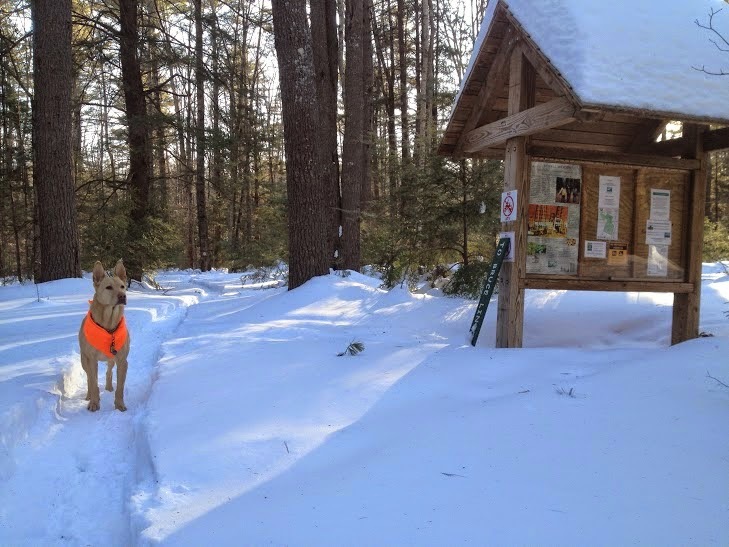 Crawford is proof you don’t need to tackle a 15 mile hike, 4000 feet of elevation, or a day-long trek to connect with your pup(s) and get everything you could possibly ask for out of a hike in the Whites. It is steep, at least in winter, in my opinion. However, it is a short hike, only 2.5 miles each way. It starts easy and there are only one or two reprieves along the way, but after the intersection with the spur, it improves and you have the super motivating views to keep you going. The dogs did extremely well and thoroughly enjoyed jogging down. At the summit, they have the sense to avoid the icy sections of rock and Ty vehemently refused to be anywhere near any remotely questionable rocks for a photo when the wind would pick up (smart girl, I tried very hard to convey my approval after asking her to move places she didn’t want to). 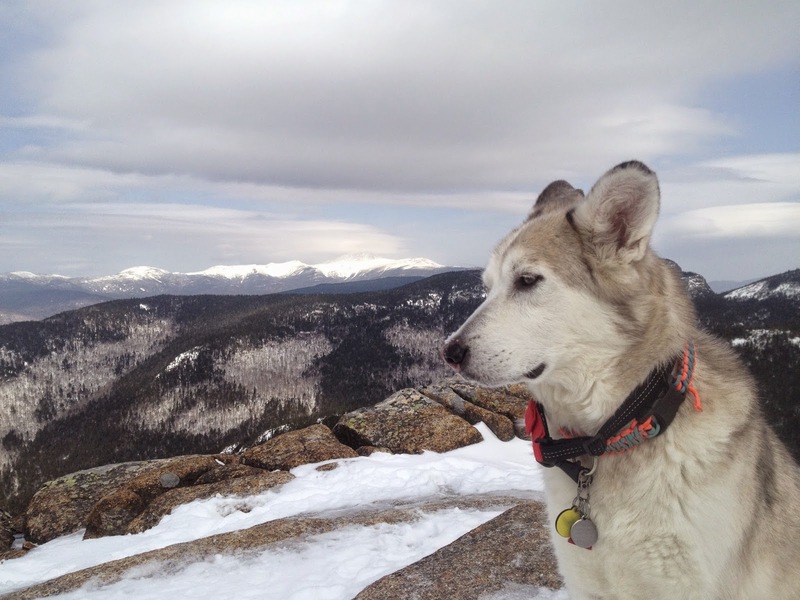 They do, however, love to lean over ledges when the air is calm ;) If hiking with inexperienced dogs, you may want to consider leashing them at the summit until they prove themselves. Great trial or half-day trip overall! Packing up, I didn’t have to rush to avoid frozen limbs like the last few hikes. I was even barefoot for a bit (this is significant to me!). I laid the dog beds out on the ground, sat on the bumper, and unfolded the map for some mini-hikes. Tango didn’t seem overworked and Ty definitely needed the extra exercise so we walked around Willey Pond (a little further up 302) and along the Saco at First Bridge Park in North Conway before heading home. They’re both great places to let your dog stretch his/her legs if you’re passing through or vacationing. Flat yet interesting, easily accessible, and provide nice views for humans. 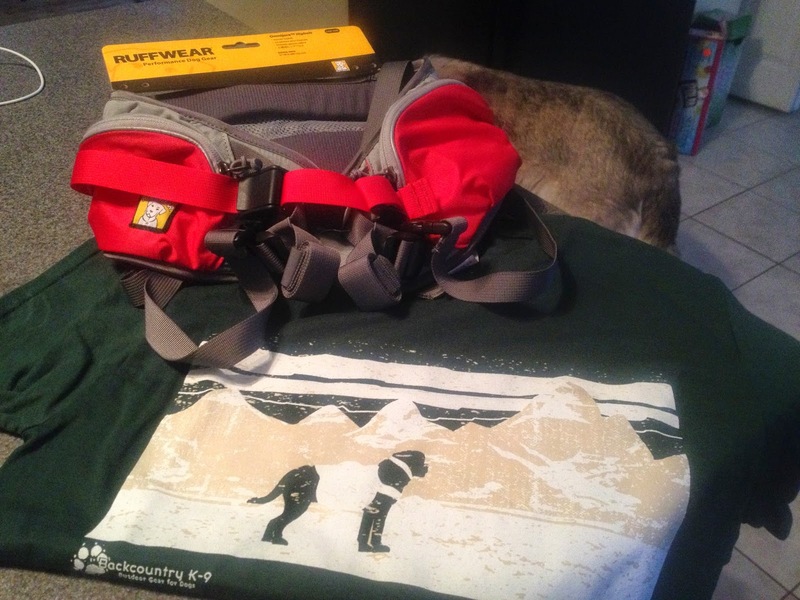 I’ve got a lot more to share, including a review of Ruffwear’s Omnijoring Hip Belt and introducing our new foster pup (tomorrow) but I think my Crawford story is long enough for one night. Happy Trails all, thanks for your support! If you’re in New England, you can attest to the cool but gorgeous weather on Saturday. It was one of the nicest days of the month, bluebird skies from start to finish, and we took full advantage of Mother Nature’s offerings! 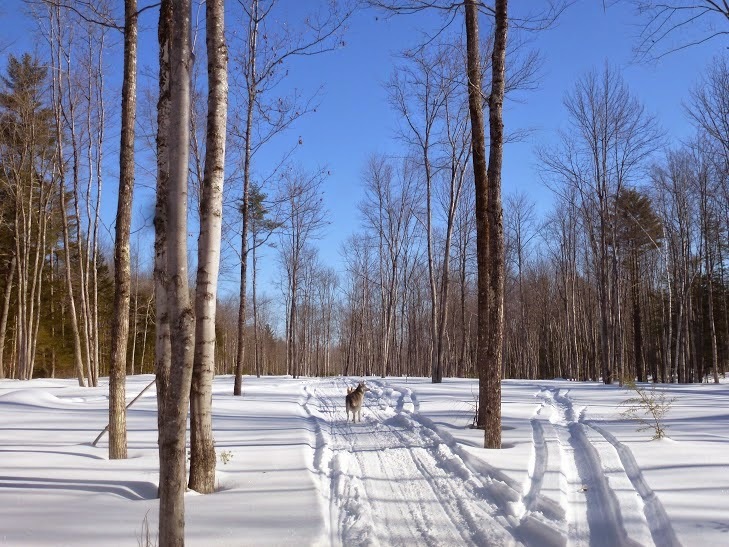 The day started with two brief walks on the snowmobile trails behind the house. I often avoid going back there but we discovered riders had carved a new trail through a sparse deciduous glade that was absolutely stunning. All this just for a quick jog! When we returned home, Ty followed me around incessantly; she knew our day wasn’t over! This is where I get to introduce one of our favorite places: Fuller Farm, owned by the Scarborough Land Trust. There is no shortage of trails or stunning vistas here. The trails are gentle and the footing is good. The parking lot opens up to huge fields that are used for haymaking by the organic farm across the street. (A brief note that dogs are to be leashed in the fields from mid-spring to mid-summer for the safety of nesting birds.) The remainder of the 189 acres are wooded trails that crisscross one another and the Nonesuch River. 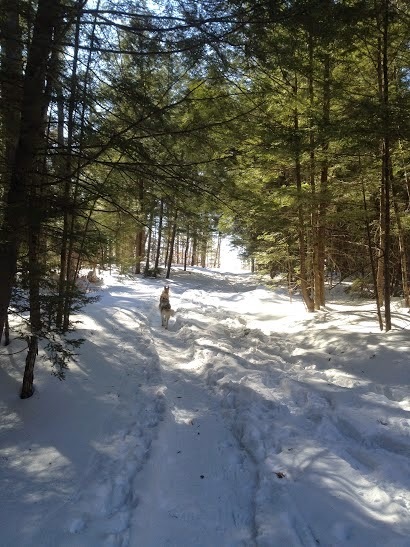 The property is less than ten minutes off of Route 1 in Saco/Scarborough and any number of route options are possible from a 20 minute loop to endless hours of walking/jogging, snowshoeing, and cross country skiing are possible. Reminds me of the "green tunnel," not a humble southern Maine park! By late afternoon, Tango was satisfied with the day’s quantity of exercise but Ty and I wanted to go out one more time so I gave Tango a bone filled with frozen coconut oil and food and off we went! Another, smaller gem in our area owned by the Scarborough Land Trust is Sewall Woods at the corner of Hearn and Ash Swamp Road in Scarborough. 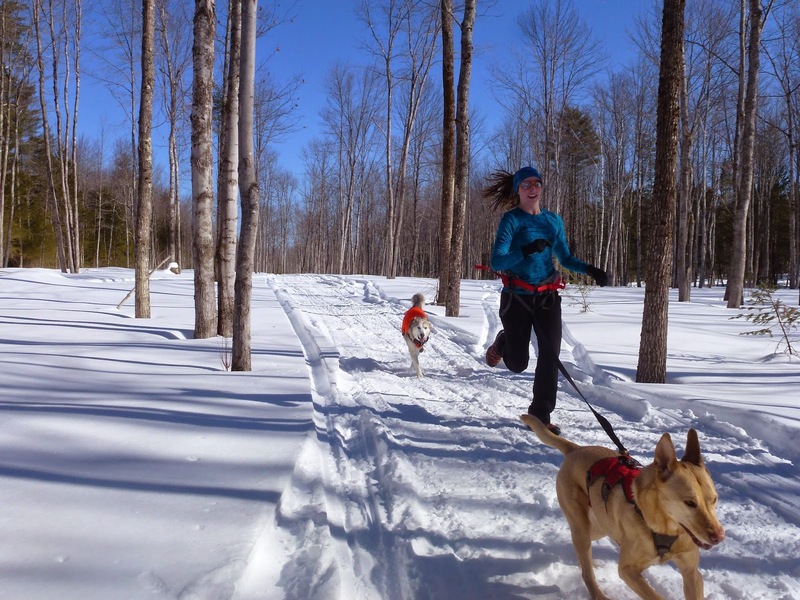 From the parking (not plowed in winter), there is single trail to an intersection where one can choose between two loops (.5 mile and 1.0 mile). Same rules apply but this is entirely wooded and, as we discovered yesterday from the tracks, is essentially Route 1 for deer so recall is a MUST. I believe this was the most mentally challenging walk Ty and I have taken. She had to exercise so much self control (being the instinctual hunter she is). We had so much fun just the two of us and her recall was impeccable. Proud mamma right here! Sunday we spent the afternoon at our absolute favorite park, Peirce Island, in Portsmouth with some amazing dog friends and their pups (dog friends are the best!). 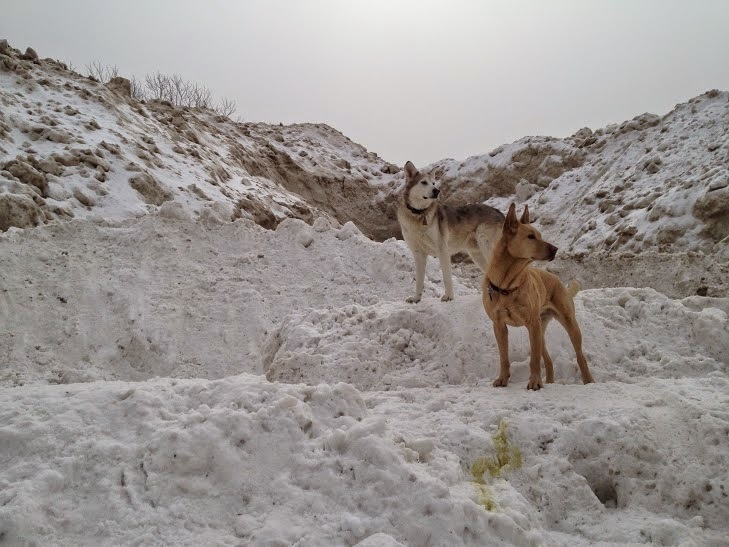 The city unloads much of its snow in the large dirt parking lot every winter. You have to see it to believe it. I call in Mt Peirce South! 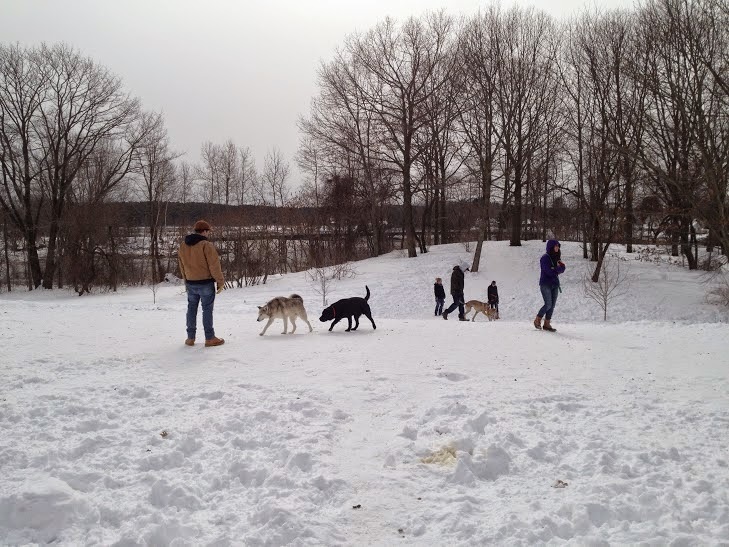 Peirce Island is where dogs go to be dogs. In other words, if your dog has a hot date immediately following your walk, save this place for another day. There’s mud, salt water, and every wonderfully dirty substance you can imagine (and I love it)! 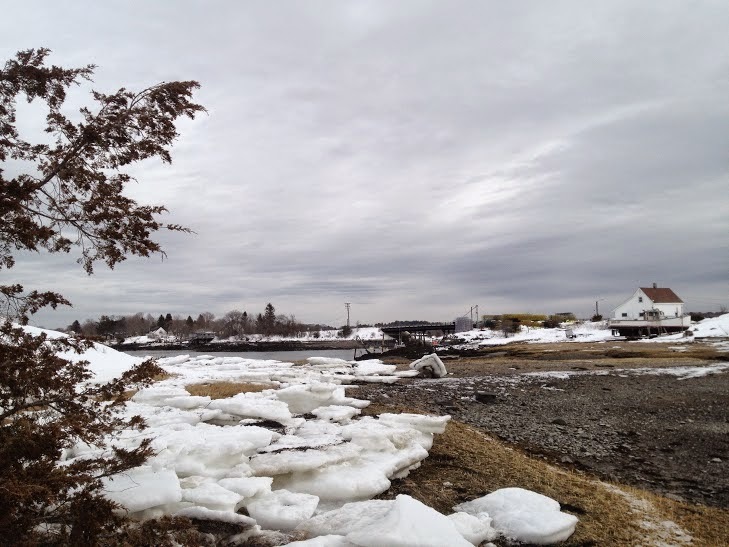 Peirce Island is an island off of the downtown end of town with a single road running its length. It includes a boat ramp, public pool, playground, and, most importantly, the very end is an off leash park. PLEASE be aware that the road runs right up to the top where the town’s water treatment plant is, bisecting the park and many tourists do not realize it is a dead end so, while I truly feel it is one of the safest places for dogs to romp off leash, there are downfalls. A dirty dog is a happy dog! The pluses: a large play field for social dogs and playing fetch, a large loop for walkers, another open space on a hill for more socializing, and water access. 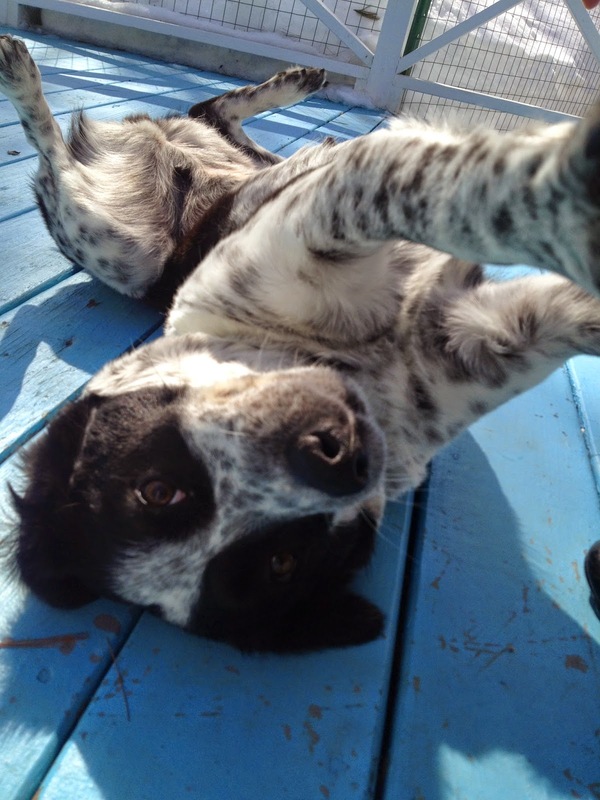 Tango loves the gentle grades, dirt paths and greeting all the human walkers. Ty lives to hunt squirrels. She can be seen streaking from tree to tree, in the thick brush, and clopping through the low tide mud. 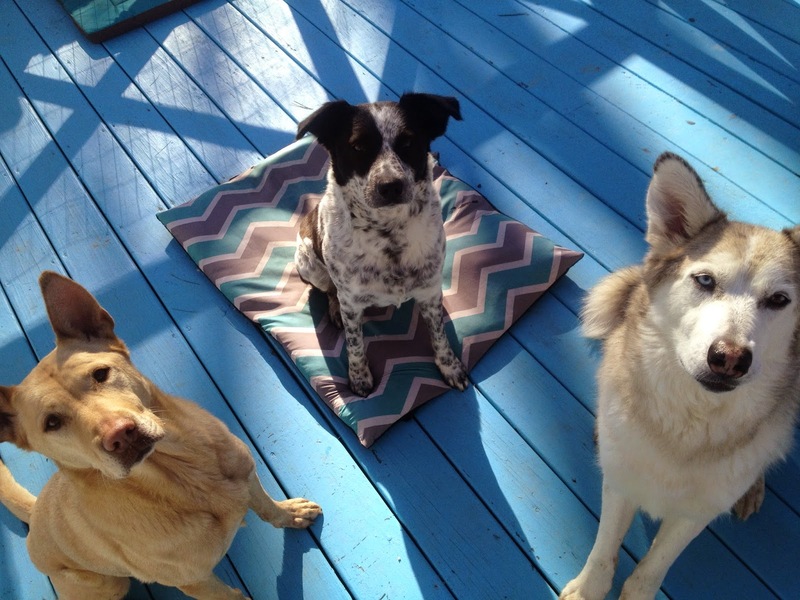 There is a little something to fit any dog’s fancy here and plenty of opportunities for humans to socialize too! The main playing field to the left as you drive in. The main water access is also on that side. on the side of the parking lot. It is more protected from the wind. The perimeter of the majority of the park is sticky, soggy mud in low tide. 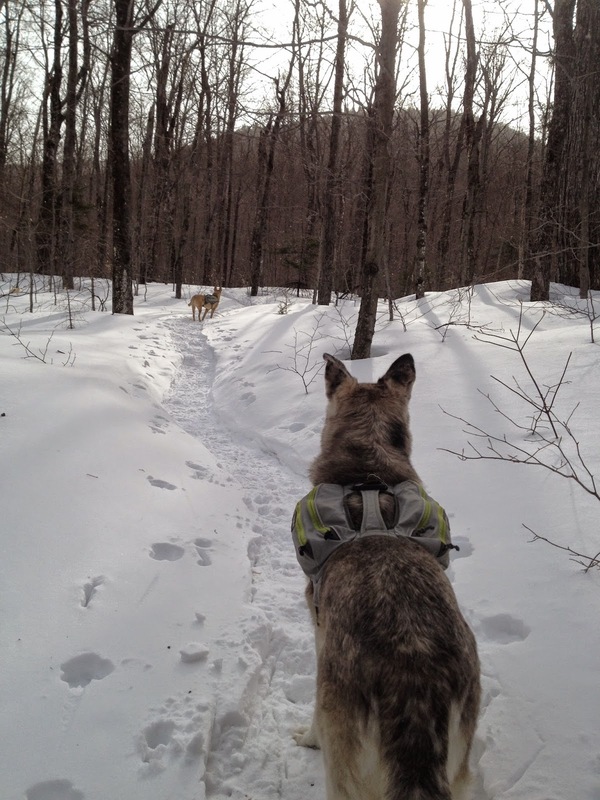 Most visitors stick to the trails but the dogs love all the interesting features and smells. when the tide recedes, so does the natural barrier to the edge of the park. 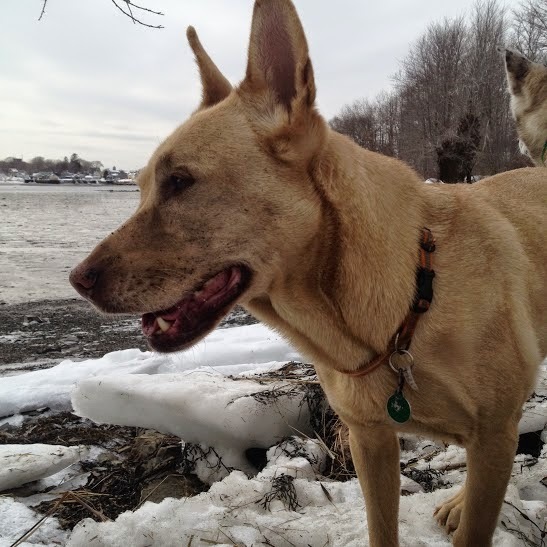 So that’s the start of our very unofficial guide to southern Maine for dog owners. I feel compelled to put in a little plea at this point, although I am sure I am preaching to the choir, to be awesome stewards of the lands we visit, picking up after our pups and be respectful, responsible folks. Thanks for sticking it out again; I hope I get into the blog-writing, photo-posting groove soon enough and manage to streamline my ramblings! Until then, happy trails!